In his debut year at the under 23 or Espoir category, and at only 18 years of age Banbridge CC’s Mark Downey has come away from the 2015 Irish National Cycling Championships with a remarkable Bronze medal in the Time Trial. The 2015 National Championships were held in Omagh – the first time in 10 years that they have been promoted in Northern Ireland. With the majority of the Irish professional riders travelling home for the event in the hope of securing the privilege to wear coveted National Champions jersey for the next 12 months, competition was always going to be of a very high standard. Mark Downey has a past record of performing on the big occasions however and indeed was the National Time Trial Champion in 2014, albeit at the younger Junior category. The clear favourite for the Espoir event was Belgian based professional rider Ryan Mullen of the An Post Chain Reaction squad who famously lost out on winning the 2014 World TT Championship by the narrowest of margins – 0.48 of a second. He was also the fastest senior rider in the 2014 National Championships. On the evening of the event in Omagh, weather was changeable; string side winds on the exposed roads with temperamental showers, meaning many of the technical sections of the course had to approached with caution. The terrain was also not typical of a TT course, with rolling roads and steep climbs in sections. 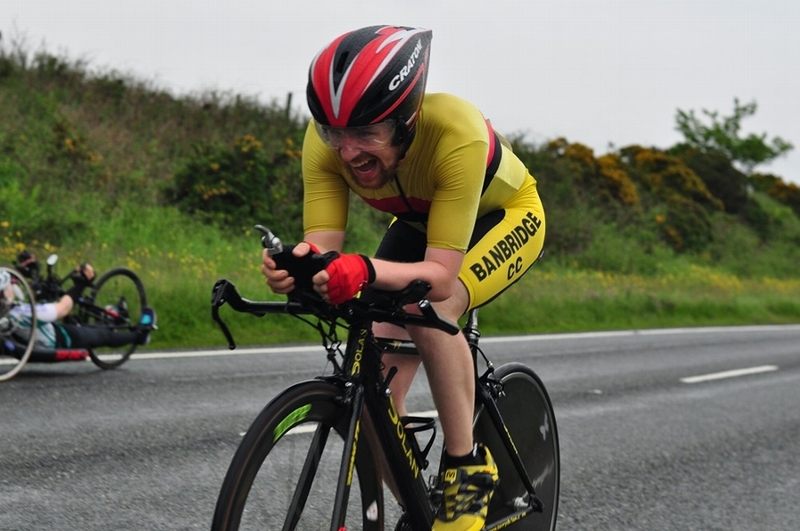 Many of the best TT specialists rely on their ability to set a fast and constant tempo which can be sustained for the duration of the event, however with the nature of the course and the constant changing gradients this would prove extremely difficult. As one of the higher ranked riders Mark was given a start time towards the end of the event when the faster riders would set off individually against the clock. When his time came in, 49 minutes and 19 seconds he was the fastest of the Espoir riders and indeed in the hunt for the senior medals also. The main favourites were yet to come however and he would be bettered by TT specialist Ian Richardson of Dublin, however with Richardson being an Elite category rider Downey would still lead the Espoir category. As riders final times were calculated Downey’s position held and it wasn’t until NFTO professional Eddie Dunbar completed the distance that Downey would be overtaken as the Espoir leader. The final riders were Martyn Irvine, a World Champion on the track and known for churning out the power over difficult terrain, and defending National Champion Ryan Mullen. Both of these riders would better all times before them and Mullen defended his 2014 title, taking with it the Senior title also. Mark Downey’s time was still fast enough to secure the bronze medal podium spot in the Espoir category and 5th fastest time on the night, a remarkable achievement given the Dromore lad has had final school exams which he completed only in recent weeks as his main focus this year and was beaten only by full time professional riders, indeed he also beat numerous full time professionals who will be wondering just how fast Downey could go if he was also given the opportunity to dedicate his time to the sport. 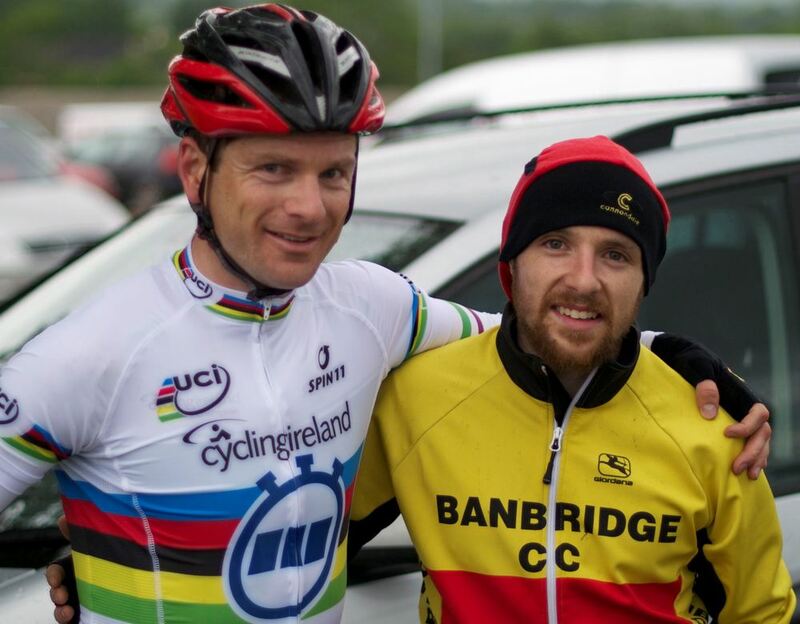 Banbridge CC was also represented in the Para-cycling Championships by Chris Burns who came agonisingly close to a podium finish in the worst of positions; 4th place. His competition was won by current road and TT World Champion Eoghan Clifford of Galway, again showing the level of riders and competition he was against.